Home / This Week / The Island Gets a New Fire Engine. The Island's first completely new fire truck arrived today on the Emerald Isle. 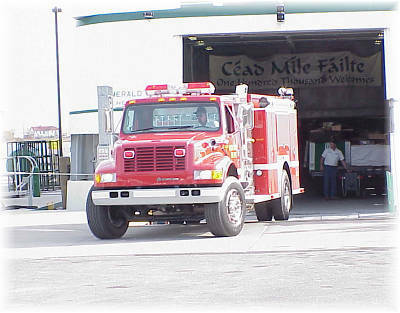 Built in Ocala, FL the E-One truck will be put in service after the Beaver Island Volunteer Fire Dept. gang gets their training from factory representatives who delivered the truck. The chassis is a sturdy International truck with a 6 cylinder diesal engine and automatic transmission. 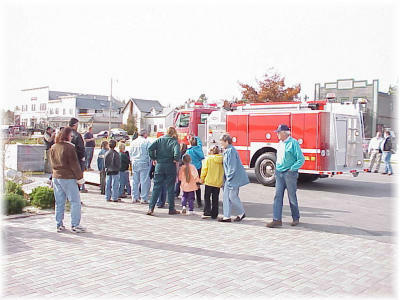 The $130,000 Fire Engine will be a welcome addition to Beaver Island's aging fleet of fire trucks. What a beauty! Many island business people and Mr. Myers' class from school as well as our firemen greeted her at the boat. Good job people, but let's pray she never needs to be used!